Shirts With Random Triangles: Rutgers suspends head coach Kyle Flood three games, $50,000 fine. 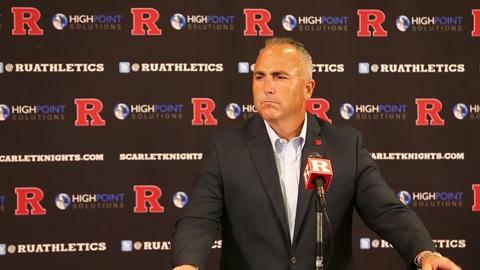 Rutgers suspends head coach Kyle Flood three games, $50,000 fine. Kyle Flood. Image via nj.com. 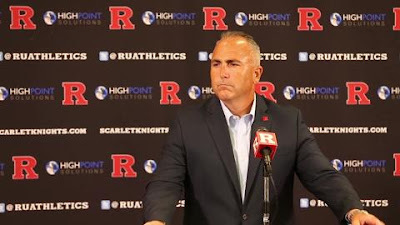 NJ Advance Media is reporting Rutgers has suspended head coach Kyle Flood for three games and fined him $50,000. Rutgers University president Robert Barchi spoke with the New Jersey-based news service shortly after he informed Flood of the suspension. The suspension follows an investigation by the university regarding allegations that Flood improperly contacted a faculty member via e-mail regarding the academic eligibility of a member of the Scarlet Knights football team. The player in question, cornerback Nadir Barnwell, has since been dismissed as part of a group including four other former Rutgers players that have been charged with assault. Two other players, were been dismissed, having been charged in connection with a series of home invasions. Flood has also suspended wide receiver Leonte Carroo following an incident following the Scarlet Knights' loss to Washington State on Saturday. Rutgers is 1-1 this season. It goes on the road to face Penn State this coming Saturday.